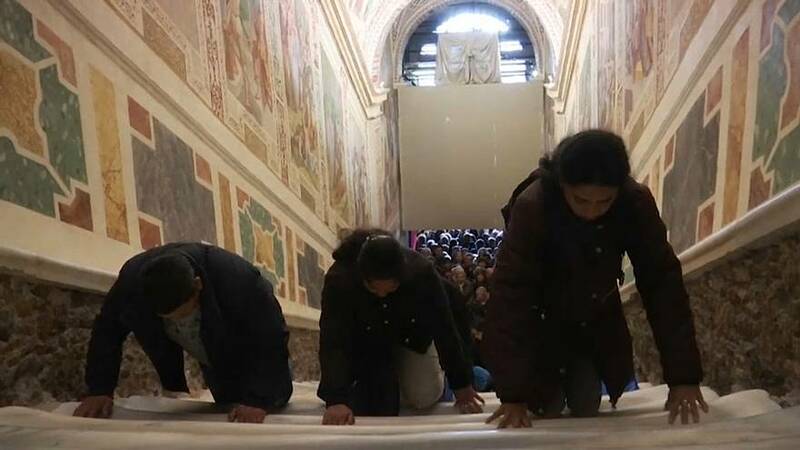 The Catholic faithful got down on their knees on Thursday to climb the newly-unveiled marble steps known as the Scala Sancta (Holy Stairs) at the Vatican. The Holy Stairs were brought to light for the first time in 300 years after a seven-year restoration project having previously been protected by a wooden covering. According to Catholic tradition, Jesus Christ is believed to have climbed the Holy Stairs before the crucifixion. They were reputedly brought from Jerusalem to Rome by Saint Helena in the fourth century. Climbing the stairs gives a plenary indulgence – a way to remove the punishment one must undergo for sins – according to Vatican laws. Paolo Violini, the coordinator of the restoration, said: "Having unveiled the marble steps – apart from the emotion of having rediscovered this marble, consumed by hundreds of thousands of faithful who climbed it for centuries – led us to the important discovery that all the frescoes were made for these stairs. [The stairs] are the real relic, which gave origin to this entire sanctuary."